Heather Fields has been a freelance copywriter for several years. Her clients seem happy; and she knows her content is engaging, persuasive, and mostly free from grammar mistakes. But she also senses something is missing. Does her writing lack flair? A sense of poetry? Is the rhythm out of sync? On a lazy Sunday afternoon, Heather browses the web, thinking about buying a new MacBook. Or should she go for a Windows laptop? She opens the Apple website. Which makes it reliable, durable, and quiet. Is that the magic power of three? Is that what’s been missing in her work? And with Apple Pay, you can unlock an entire world of online shopping that’s fast, convenient, and secure. iPad mini 4 runs iOS 9, the most intuitive, advanced and secure mobile operating system in the world. Which means everything you do — playing games, surﬁng the web, enjoying photos and videos — becomes more personal, immediate, and immersive. Copyblogger founder Brian Clark explains the power of three by referring to the three-act story structure and to the Three Little Pigs, the Three Blind Mice, Goldilocks and the Three Bears, the Three Musketeers, the Three Wise Men, and the Three Stooges. It’s no accident that the number three is pervasive throughout some of our greatest stories, fairy tales, and myths. If you’ve joined a photography or drawing course, you may have come across the rule of thirds, too. But what about the number two? Why do we have two arms, two legs, two ears, and two eyes? Isn’t two the smallest number required for creating symmetry? And symmetry is related to beauty. Isn’t that magic? As the New York Times reports, research has suggested that three arguments may be more persuasive than two or four. But the scientific proof for the persuasive power of three remains hazy. Trios may or may not be more persuasive, but they can create a sense of poetry and rhythm, making our content more pleasurable to read and adding stress to a statement. Pay attention to good writing, and you see threes popping up everywhere. You may have heard repetition in writing is bad. But that’s only true for accidental repetition. As writers, our toolbox may seem limited. We can’t shout. We can’t use body language. We can’t even bang on a table to add weight to a message. Following the rule of three religiously, however, becomes monotone and dull. So, use trios in moderation. How often do we read content that surprises and delights? How often are we really inspired by a blog post? Life is too short for monotone voices. Life is too short for wishy-washy writing. Life is too short to regurgitate ideas without adding value. It’s time to have fun, infuse your content with your personality, and dazzle your readers with your words. The number three is the smallest number to create a pattern; and patterns please our minds. 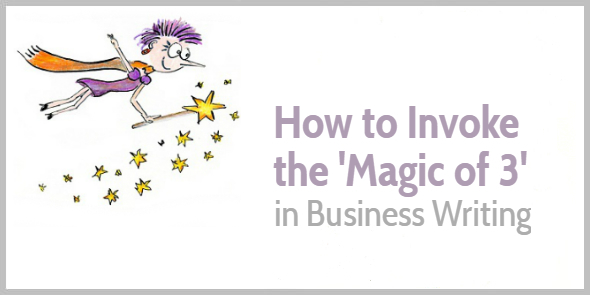 Use the magic of three in your content. Add a dash of flair. A sprinkle of rhythm. And a dollop of poetic beauty. Your readers will hippety-hop through your content, with a smile on their face. Your ideas always bring a big smile on my face. Your ideas create a ocean of possibilities in my mind. Your ideas always leave behind a meaningful impact on my writing. Love this post : fresh, short and useful. By the way, I created a free ebook and named it with the rule of three. In english, it says “10 Secrets for Posts that get Read, Shared and Commented” (hope I translate this right). According to you, is it a good title ? Thanks for share good content like this one ! The title sounds pretty good. In English, the word “secrets” is a tad overused (and rarely refers to real secrets), so in English I’d probably go for “little-known tips” or something similar. But this may be different in French! The phrase je ne sais quoi is ot typically written with hyphens. Think of savoir faire for instance, or amour propre. I didn’t know there was a prescribed way of writing je ne sais quoi. I found that many English speaker don’t even know the phrase. I’ll change it! Thank you for your lovely comment, Cathy. Lovely to have you back on deck Henneke – I’m sure you had a marvelous holiday. I did enjoy the article – thank you. Good to “see” you again, Mark! Superb stuff. The power of 3 is very important but what I didn’t know was how powerful it was and how prevelant it actually is in headlines. You have taught me something new here, my friend. Thank you for this great post. It’s pretty crazy. Once you start paying attention, you see the power of three everywhere. Glad you enjoyed this one, Andrew. Thank you for tweeting it, too. Delightful. Relevant. Poetic. Loved this post. Loved your drawings. Love the magic of three! The rule of thirds, however, tells you to put an object off-center. It has, as far as I can see, no bearing on the rule of three. Yep, that’s true – the only relation is that the rule of thirds and the rule of three are both somehow related to the number 3. I have noticed lately that each time I was working on a tagline, despite starting with one or two favorite words, I ended up with three because of the rhythm. I love the magic of three and use it often in writing. I don’t know why. Maybe because it seems so…balanced, complete, and lyrical! Thank you for stopping by again, Laurie. I appreciate it. I was beginning to worry that I was obsessed with trios. Glad to have a better reason for using them… other than “it just sounds better”. Thanks for another great article, Henneke! Go for it, Christiana. Indulge in your obsession. I do it, too! When I read the title I imagined that the power of three would refer to old-style public speaking: Tell them what you’re going to say, tell it to them, and tell them what you’ve said. But I loved reading your examples of three. And I believe that three has a natural rhythm. I find that old-style advice (telling what you’re going to say, tell it, then tell them what you’ve said) a little boring. I’m glad you still clicked through to read the post and that you enjoyed it! Here’s another magic of three’s saying: “The third time is a charm”. It may be magic because our brains don’t want to digest more than three things. Ah yes… The third time is charm. That’s a good one! I also read about our brains not wanting to digest more than three things, but some of information contradicting this, so I checked with my husband (who’s a cognitive psychologist) and he said it’s a myth. Good to see your smiling face again! To follow on from your article, I read recently that odd numbers (including 3) leave the reader/viewer with a sense of ‘something’ missing. Apparently, this creates a natural impulse to discover the missing element. Could this be one of the factors why 3 is a magic number? Yes, maybe! Interesting point – I haven’t heard about that before. I guess that perhaps we look for symmetry and therefore think that odd numbers are missing something? Thank you for stopping by to add your thoughts, Craig. I appreciate it. Yes, I think that’s exactly it. Welcome back from your hols. You are really cooking! I am a believer in the enchanting power of 3. It really works. 3 separate raw ingredients (words/sentences), that when combined together in the right measure, magic happens and they are transformed into something special (an experience). Pure alchemy! Pure alchemy. True enchantment. Or a touch of magic. I read, save, and then re-read everything you send me. I have no URL yet, but because of you, I still believe I will get there. “Read, save, and then re-read” – You’re a natural when it comes to using the magic of three! Good luck with your website, Judy. Let me know if you have specific questions? Am I (65+) too old to be taken seriously? I’m drowning in fear about it. Age for me is positive – you have more wisdom to share than younger people. I also think that people pay attention to the people whose voice and ideas resonate with them – it’s less about age or location, and more about being like-minded spirits and having something to share that resonates. You make a lot of sense– I need to let go of my age phobia and focus on my writer’s voice. I’m going to get busy doing just that! Thanks for sharing and making me think. It was so much fun to find the right examples and weave them into the post! I love the process of transforming dull text into content that’s a pleasure to read. I find it a lot more fun than writing a first draft! Enchanting as always, Henneke! 🙂 I’ve found myself using this technique sometimes in the past without realizing it. Now I can be more deliberate and effective! I’m not surprised you’ve been using the power of three without realizing it. I think it’s a natural rhythm. You writing is always cheerful, concise and comprehensive. Thank you for your compliment, Nicolas. 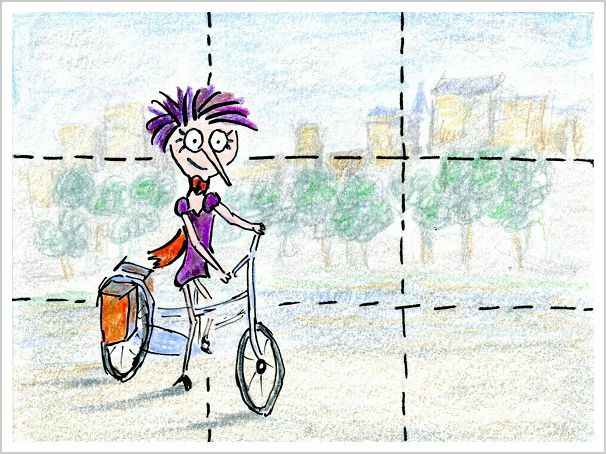 I smiled when I saw your cartoon — I was just teaching the Rule of Thirds last night to one of my live classes :). Thank you as always for so many examples. I know it takes time to fin them , and to link to other great blog posts, and yet you over-deliver on examples each week. It makes all the difference. And you’re absolutely right – it’s a lot of work to find all the right examples, but it’s fun, too! Always good to see you here! I like the reference to the three little pigs and three blind mice – are these stories the things that have trained us to think in threes, or were they simply following a much older rule. There’s the Holy Trinity, for example. It could be to do with triangles being the strongest shape. All I know is when I write a list of anything in a sentence, three things feels OK. Two seems to be missing something and once you get to four it feels awkward. I read that many world religions have the concept of trinity. Perhaps that suggests that thinking in threes pre-dates the three little pigs and three blind mice? It’s an interesting philosophical question! The strength of the triangle is another interesting point. Thank you for stopping by to add your thoughts, Steve. I appreciate it! This is so informative and helpful for any style of writing. I’ve taught writing for years and often invoke the Rule of Three for my students.